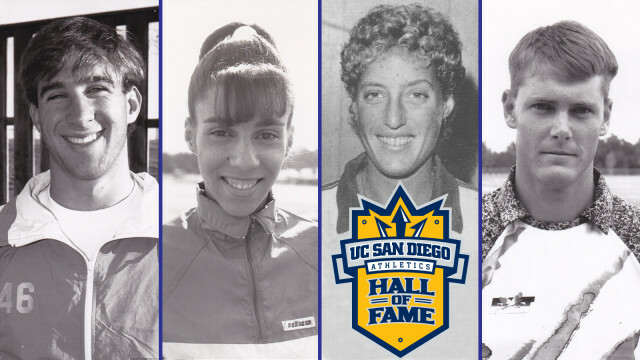 The four newest members of the UCSD Athletics Hall of Fame. Courtesy of UCSD Athletics Department. The four athletes inducted were John Flowers (swimming and diving, 1990-94), Erica Hinckson (cross country/track and field, 1990-93), Louise Schwartz (volleyball, 1980-83) and Brian Siljander (soccer, 1987-90). Flowers was a seven-time NCAA Division III national champion, two of them individual and five relay titles. Hinkson was a 10-time All-American and won UCSD Athlete of the Year three times during her tenure. Lastly, Schwartz helped lead the school to it’s first-ever national title in 1981 when the Tritons won the NCAA Division III national championship for women’s volleyball. Even though the Hall of Fame has only been in existence for two years, Edwards believes its impact is already being felt. “The UC San Diego Athletics Hall of Fame has already become a significant part of our tradition,” he said. “The level of success our program has enjoyed throughout its history makes membership a truly elite honor.